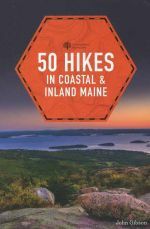 50 Hikes in Coastal and Inland Maine, by John Gibson. 5th Edition, 2016. Covers hikes in the coastal hills (Camden Hills, Acadia National Park, etc.) and the SW mountains such as Pleasant Mtn., the Evans Notch area and the Mahoosucs. Topo maps and interpretive info for each hike. 204 pp, 6” x 9”.